I’ve been pretty disappointed with most of Vee Rubber’s fat tire offerings. It surprises me that the largest fat tire manufacturer in the world seems to have the hardest time coming up with decent tread patterns. It seems like they would do a whole lot better if they did what every other tire manufacturer in the world did, and just blatantly rip off other manufacturer’s tread patterns. The Snowshoe XL is a decent tread pattern that is very similar to the venerable and skinny Snowshoe 4.5. The Snowshoe XL 4.8 is significantly smaller than my current favorite snow tire, the Snowshoe 2XL 5.05. The XL still performs quite well for what I would classify as a ‘budget’ fatbike tire at around $90 street price for the 120TPI version. There is also a studded version of this tire that also runs around $130 street price, the same price as a non-studded Surly Bud or Lou. You can add studs later for about $60 for a stud kit and insertion tool that includes 250 studs (enough for 2 tires). If I were you I’d get the studded version up front and let the Chinese laborers do the grunt work of getting all those studs in (not fun). The Snowshoe XL (newer model years) are stud-able if you have the patience for it. I don’t. 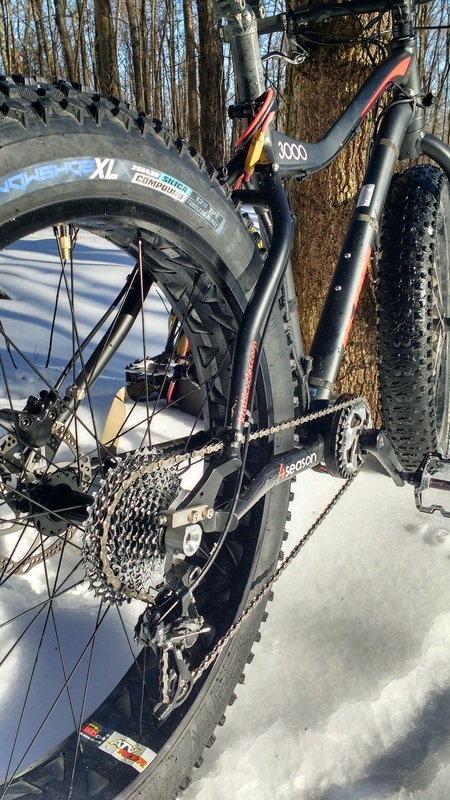 I tested the Snow Shoe XL 4.8’s with tubes on 100mm rims that shipped with my KHS Four Seasons 3000, which BTW is the nicest fat bike I’ve ever owned. Although I probably never would have gone out and bought these tires new, they were the best tires that I’ve ever gotten preinstalled on a fat bike that I’ve purchased. I’m not sure why, but it seems most cheap fat bikes are sold with really horrendous tires that frequently end up in my giant used fat bike tire pile. 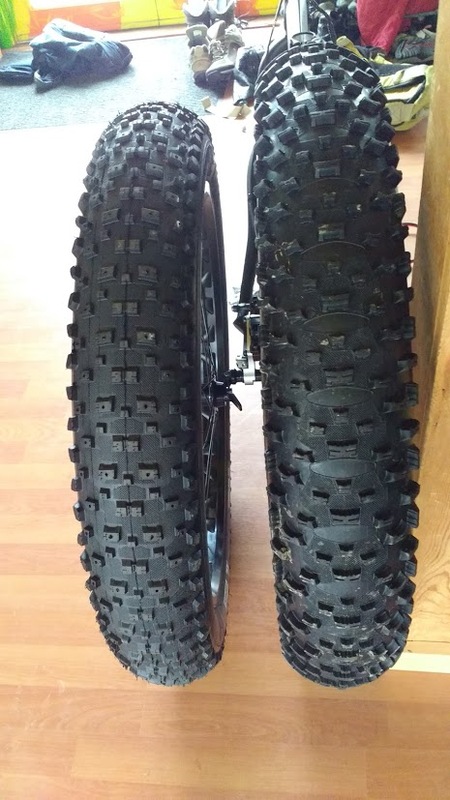 The Snowshoe XL 4.8 was a great tire that I’m not sure why many bike manufacturers don’t sell their fat bikes with these tires or something else of comparable quality. My guess is that they are trying to keep their costs down and their profit margins high. You can see that the 2XL (right) is might bigger in diameter than the XL but they are nearly the same width. Both tires are on 100mm rims. I had no problems pulling this supple tire on and off the rim and it seems to center really well when I moved one of them to the front of my Phat Phuk for testing. The Snowshoe XL is very close in width to the Snowshoe 2XL, but the 2XL has a much larger diameter and much more volume in the tire. This means the 2XL will safely run at much lower tire pressures than the XL will without fear of pinchflats. I’ve been running my 2XL’s with 5psi or so and tubes and have yet to have any problems with them. While testing the Snow Shoe XL’s I used ultralight Qtubes and ran them at about 7-8psi without issues. Powder – 4.5 : Not bad, not bad at all. This tire outperforms it’s skinnier cousin the Snow Shoe 4.5 but doesn’t hold a candle to the Snow Shoe 2XL which is the best fat tire I’ve ever ridden in powder by a far margin. Ice – 4 : I’d be lying if I said I didn’t bite it hard more than once with this tire on ice patches. If you’re riding over glare ice patches you’re going to want to get the studded versions which would be rated 5 not 4. 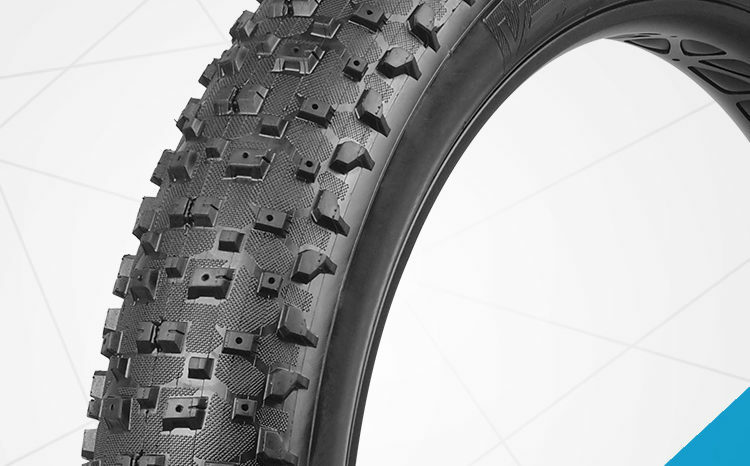 Singletrack – 4 : Decent, reminds me of the Bulldozer 4.7 tires with a little more lateral traction and more rolling resistance. Rolling Resistance – 3.5 : For the size lugs it has surprisingly little rolling resistance which makes it a pleasure to coast with on the trails. Weight – 3 : About what you’d expect at ~1600g. Pretty heavy for the not-so-big lugs and a not-all-that-fat tire. Although this tire can be had for about $30-40 less than the Surly Lou and Bud, I still feel like those tires are both quite a bit better than the Snow Shoe XL. The best fatbike tire you can have is really the biggest one you can fit in your frame. If you can fit a Snow Shoe 2XL 5.05 in your frame then I can assure you that you will not be disappointed. So far the only frames I know of that will fit this tire in the rear are the Bikes Direct Lurch and FB 5. There are plenty of fatty forks that are non-suspension that will fit the 2XL, your best bet is to measure before you buy the tire. 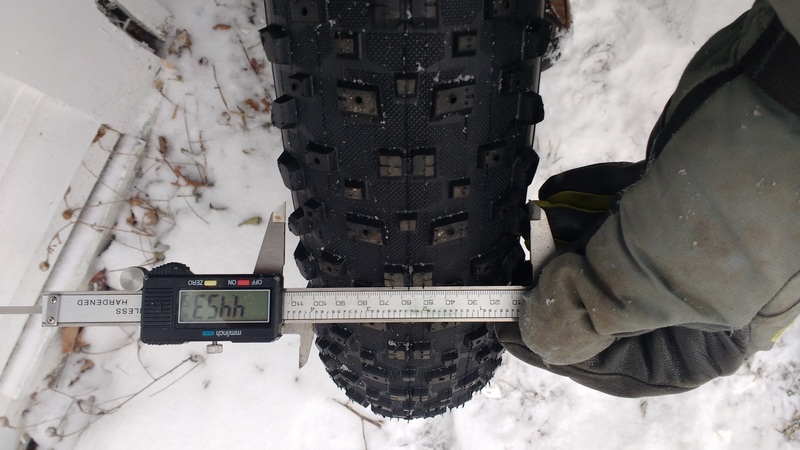 The Snow Shoe XL should fit on any 5″ tire fatbike as it measures less than 4.5″ on a 100mm rim. Would I buy this tire if it didn’t come on a fatbike? Probably not. I might buy it with studs if I could get it for cheap, but that being said it is one of the only fatbike tires I’ve ever gotten on a fatbike that I haven’t replaced. That’s really saying something. I wish more factory fatbikes came with decent tires. It might motivate more people to get into the sport if they didn’t have to buy new tires to replace the crap that shipped with their factory bike. Until that day comes, just make the best out of what you’ve got. Thanks for the info Karl – I am leaning towards getting this build through Luna, as opposed to BD’s Boris X9 LTD with Bluto. For beach sand and steep canyon rides in Laguna Beach do you think a Bluto is a recommended upgrade, or can one get by with a Thudbuster LT for smoothing out the bumps? I never ride my suspension fatbikes, although they are much nicer on singletrack at higher speeds. The problem is that with a susp fork I end up going so fast that I could actually really hurt myself, without one I tend to exercise more restraint. Reviewing the KHS 3000 in a day or three. Wait for the review to come out before you buy. Hey Karl ever thought of going tubeless on the KHS 3000? Riding snow is kinda new for me and trying to figure out the right pressure for powder snow and skidoo trails… I’m at 7psi in the front and about 8-10psi on the back and so far it’s been good. I’m fairly light at 150lbs and ride the KHS 3000 with stock tires. You can go lower with Tubes if you’re riding in snow. I would get a digital meter and run them down to 6 psi in the front and 7 psi in the rear. You should be fine. I have been riding the XL for almost 2 winters now, (and one summer), and they are great. The bike I’m building now will have an XL in the front and a 2XL in the back. The frame is an RSD Mayor and it can take the 2XL (except the small sixe of frame). RSD is a Canadian company and they sell online. You can get complete bikes or just frame, or carbon fork. Excellent blog you’ve got here.. It’s hard to find good quality writing like yours these days. I truly appreciate people like you! I’ve learned a lot!